How Long Are Truckers Away From Home? The amount of time a trucker is away from home while on the road varies greatly depending on several factors and stages of the process. The best way to get home more often is to get a trucking job with a company that has a terminal near your home. Another plus is if you stay on a high truck traffic highway or city and the trucking company that you choose has trucks that are part of that traffic. Some times people who are interested in driving are misled when they ask questions about home time. Partially because the person inquiring doesn't ask the right question and partially intentionally just to get the driver in the door. Don't ask, "How often do your drivers get home?" Ask, "How often can I expect to make it home based on where I live, if I go to work with your company?" You can also ask if there are other drivers in the area. You also want to ask how long before you get back home after first getting there for training. Can be 3-8 weeks. Generally speaking after training the average trucker will be out 2 to 3 weeks at a time. Sometimes more... other issues are further discussed below. 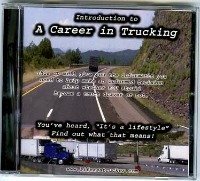 Students in truck driver training at a company will usually have to stay at the company(not literally) for how ever long the training program is. Usually at a hotel. When you finish, you should have your CDL. The time this takes can vary depending on the trucking company you decide to go to. This is usually a straight forward time frame if you ask the question. "How long is the training to get my CDL." After finishing the training your schedule may be a little fuzzy. You might be told that you can go home but some companies will not let you go home right after training until you complete the next stage. Sometimes they have to wait for a trainer to come in and pick you up. They may say something one day and something different the next day. There could be several reasons for this. One being a shortage of trainers. Going home could mean staying at home for an extended period of time. You have to ask them about that. Students at the facility ready and waiting might be who goes out with a trainer. It's important to know that the story can change from when you talk to the recruiter from home with the wife to when you are actually at the company in the training program. Out With Driver Trainer/Mentor etc. After your training at the trucking company you can either go home or straight out on the road with a mentor, driver coach or trainer. They can be called different things at different companies. Basically, this is the period in which you learn the ways of the trucking company. The period prior to this one was for you to learn how to drive the truck. Unfortunately, I can't tell you how long you will be held here as it varies. For Swift last I checked it was 6 weeks. For other companies it could be different. "After getting my CDL, before going out with a trainer, will I be able to go home?" "How long is training after getting my CDL, before I get my own truck?" "Will I be able to go home during this period?" Once you are in your very own truck, things should get a little less chaotic. You probably can have a little more predictable home time. The average driver will probably stay out on the road anywhere from 2 to 4 weeks at a time. Some even more. Where you live - For instance some companies won't hire east of I-95 because it too unpredictable or costly to get a driver back home when desired. All companies will have some locations like this OR you never get home on time. How close the nearest terminal is to you - For some companies this matters, others it does not. How close you live to the frequent lanes of operation - Some companies only operate on certain highways often. Other routes they may rarely travel. If you live where they rarely goes that will keep make it harder to get you home. What type of freight or hauling the company does - For instance, I haul furniture. Because of this, I went out and came back in. If you have a trucking company that is hauling specific freight for a company local to you, you may get home more often. What division you are driving for in the company - Larger companies have many divisions. Some divisions haul from terminal to terminal. Some divisions server only specific stores like Dollar General accounts, etc. Some Divisions are dedicated to a specific region and the trucks go out, deliver to that region then come back in to pick up another load and repeat the process. This is why I tell you to go to a truck stop and find a driver for the company. With any luck, one that lives not too far from where you do. Ask him/her how often they are able to get home. The reason this is a magic number is because many more trucking companies will hire you with 1 year of experience. By this time you should have a good idea of what to predict at your current trucking company. It is likely to be 2 to 3 weeks out at a time. If it is not, more than likely if you are a good driver, you can have a conversation with dispatch that will get your home ever 2 or 3 weeks if you are a good driver. If you are a good driver and they can't get you home as frequently as 3 weeks, I am pretty sure you can find one that will. If you live in a good location, getting home every other weekend might be possible. If you have accumulated violations, it may be harder to find what you want. Drivers with 3 years good driving record can get some of the best trucking jobs on the road. Higher pay, good benefits and yes frequent home time. Again, the same factors are true with location and proximity. Where you live and the operation lanes that is. But remember, you now qualify to work and many more trucking companies. That's why I say it is much more possible to find the trucking job that will really make you happy. At this point you can also find it easier to get on at smaller, medium, local trucking companies.